So there’s a large percentage of the world’s population who believe that this book called the Bible is actually the Word of God. Whether you fall in that camp or not, it’s hard to deny the power of the Bible’s influence around the globe—in both good and bad ways. In this thought-provoking episode of Swedenborg and Life, host Curtis Childs and featured guests review Swedenborg’s spiritual experiences and resulting philosophies about the deeper, spiritual messages contained within the Bible. Throughout his writings, Swedenborg takes what many consider to be a book of outdated moral lessons and turns them into modern, timeless messages of love and hope for people of all genders, races, and religions. Curtis opens up the episode with a question: What is the need and function of a revelation? In this introductory clip, Curtis provides a brief overview of the revelation of every era of humanity that Swedenborg described in his writings. From the beginning of the human race, which was very close to heaven and had direct communication with God, all the way to the eighteenth century, when Swedenborg was writing. By that point in human history, much evil had been done in the name of God and religion. 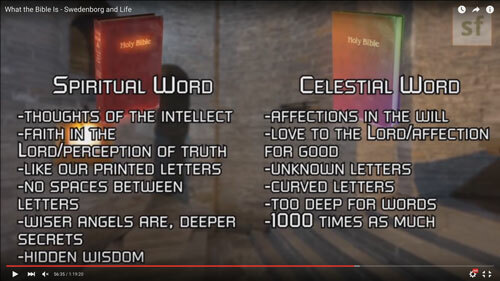 Swedenborg said the revelation for our modern era is a new understanding of the true meaning of scripture. 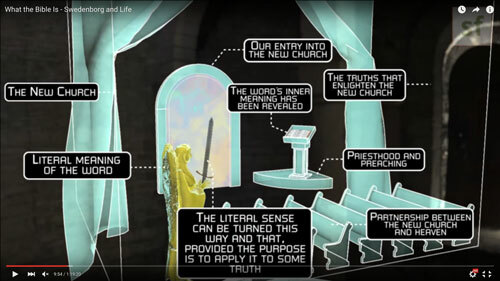 As portrayed in this animated excerpt from True Christianity, Swedenborg actually had a defining vision for a new spiritual mindset for humanity. 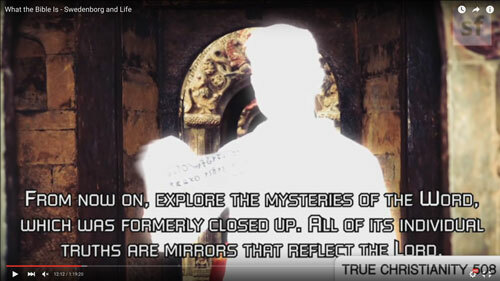 Immediately after experiencing this life-changing vision, Swedenborg then had an interaction with an angel who explained how he should explore the hidden meanings of the Bible to learn and share the truths about the Lord. From that point on it became Swedenborg’s mission to study the literal words within the Bible to uncover the internal sense of the Word of God. Swedenborg became so passionate about his new mission that his first and largest title, called Secrets of Heaven, was a verse-by-verse exposition on the books of Genesis and Exodus. Swedenborg was so diligent in his explorations of the Bible that he discovered the many times things are paired together over and over again, and he even offered an explanation for the dualities of the Bible. Swedenborg says these things are paired together purposefully to symbolize the union of the heart (love) and the mind (wisdom) as one. It’s a powerful revelation that serves as the basis for Swedenborg’s theory about the Bible’s main message. 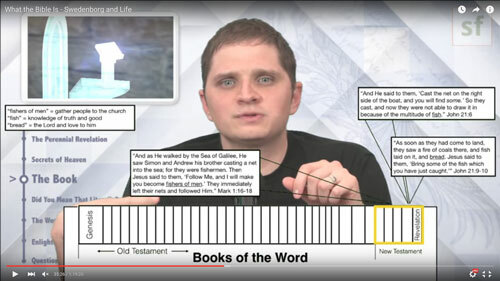 Curtis introduces a graphic representation of the books of the Bible from Genesis to Revelation to show the three different types of narratives Swedenborg described within each book. Essentially, Swedenborg says that even through all the violent and vengeful words of the Bible, the hidden message is about love for the Lord and others. 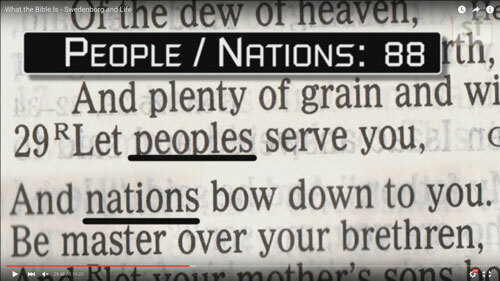 He says that even the Ten Commandments convey this internal meaning, and Curtis elaborates on the significance of that here. Did You Mean That Literally? If God wanted to provide us with a printed form of communication to last for eternity, then why would he obscure its true meaning behind complex symbolism? Why wouldn’t the text just mean exactly what it says? Curtis explains Swedenborg’s philosophy about how divine concepts require earthly containers like the Bible and introduces an animated excerpt from Sacred Scripture to explain the concept further. We can see an example of Swedenborg’s philosophy about literal v. internal through his interpretation of the prophesy about Egypt, Israel, and Assyria becoming one. Swedenborg says that the prophesy represents scholarly study, rational thinking, and spirituality become one—and is the future of science and spirituality working together for the best of humanity. 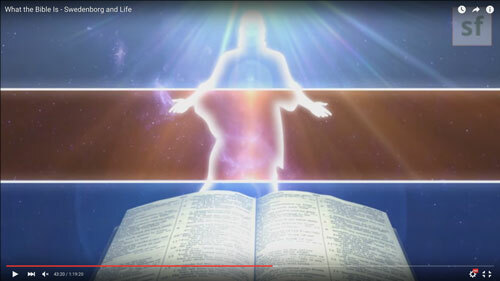 Swedenborg says the Bible does exist in heaven, but the Word in the spiritual world or afterlife is not the same as the word in the physical world or earth. Spirits and angels have an almost immediate revelation or understanding of the deepest spiritual sense of the Word in heaven so there’s no need for historical narratives and metaphors. In fact, there are different levels of understanding the Word amongst angels depending on the level of heaven they occupy. Chara Daum, a translator for the New Century Edition, explains how angels understand the Bible on different levels. Next, Curtis takes the audience through five excerpts from Swedenborg’s writings to shed some more light on the differences between the literal and spiritual meanings of the Word. Throughout his writings, Swedenborg reveals how the Bible is more of a spiritual tour of heaven than a book of moral instructions. If you believe there’s both a literal and internal sense of the Word, how can you gain access to the deeper level of understanding? Curtis answers that very question with a series of excerpts from Arcana Coelestia. 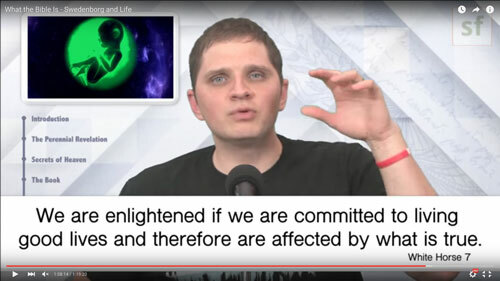 According to Swedenborg, it’s possible to connect with the Word even if you have never read the Bible, are not Christian, and have never followed his teachings on the internal sense. Swedenborg says the way to connect with the Bible’s spiritual message is to live it—or practice what you preach. You can be connected to the spiritual Word simply by living a life of love because love for the Lord and others is the core message of the Bible. After ES had access to the spiritual realm, did his hard times or difficult life lessons stop? Didn’t Jesus condemn the Pharisees because they rewrote many of the OT stories making God a supremacist, racist God that demanded Jewish hegemony over nations rather than Love for all? So, if one keeps reading the Bible, will God help open our hearts on the deeper and more real meaning? Did Emanuel Swedenborg ever meet anyone who claimed they were Satan? Will God rapture people when earth’s life is over? What would Swedenborg think about GMOs, vaccines, toxins, and the state of the environment and our corresponding health today?